Keep hands clean, healthy, and refreshed! Picture this...There were two hands and zillions of germs. Each hand busy, doing all of the things of the day and zillions of germs trying to stay involved in whatever is going on. 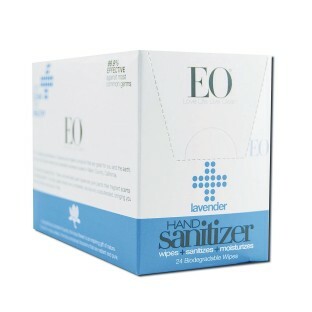 Using EO Sanitizing Hand Wipes keeps both hands clean, healthy, and refreshed while keeping germs out of the picture. EO Sanitizing Hand Wipes - the organic, plant-based alternative to chemical laden hand wipes. Compact and portable so you can take EO everywhere you go - purse, car, stroller, gym bag, and more. 24 biodegradable wipes. Ingredients: Organic Alcohol (non-GMO), Purified Water, Vegetable Glycerin,Organic Lavender (Lavandula Officinalis) Essential Oil, Organic Chamomile (Anthemis Nobilis) Flower Extract, Organic Calendula (Calundula Officinalis) Flower Extract, Safflower (Carthamus Tinctorius) Oil (and) Aloe Vera (Aloe Barbadensis) Extract, and Dimethicone (silica-derived moisturizer). Not tested on animals. Made in the USA. Ingredients Organic Alcohol (non-GMO), Purified Water, Vegetable Glycerin, Organic Lavender (Lavandula Officinalis) Essential Oil, Organic Chamomile (Anthemis Nobilis) Flower Extract, Organic Calendula (Calundula Officinalis) Flower Extract, Safflower (Carthamus Tinctorius) Oil (and) Aloe Vera (Aloe Barbadensis) Extract, and Dimethicone (silica-derived moisturizer).